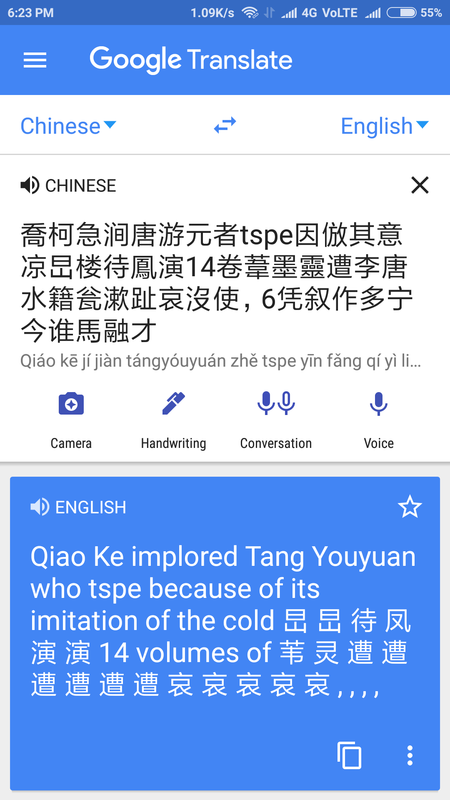 So I asked the sender, whether he could translate it for me. And he told me that he is able to read it but don't know the meaning since it is written in Classical Chinese! Could someone tell me the meaning of what's written there? used as the subject of the painting. 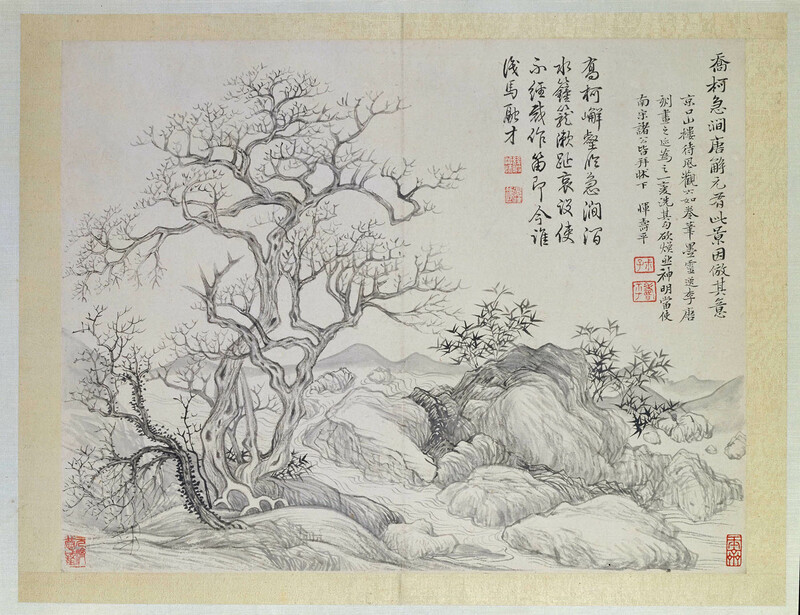 "解元", "六如居士" were referred to 唐寅, a painter of ming dynasty. [which] should (當) make (使) painters (諸公) of the southern song dynasty (南宋), all (皆) bow (拜) under (下) [his] stand (牀, a variant of 床, which should be interpret as 安放器物的架子, not bed). anyone want to decipher the seals? This paint is called 乔柯急涧, it's supposed to be made in 1675. Its author is 恽寿平, who lived from 1633 to 1690, late Ming and early Qing dynasties. The 2nd part is the explanation about the paint, written by the author 恽寿平. It's explaining that the paint is pastiche from 唐寅 (唐解元), the artist of the Ming dynasty. 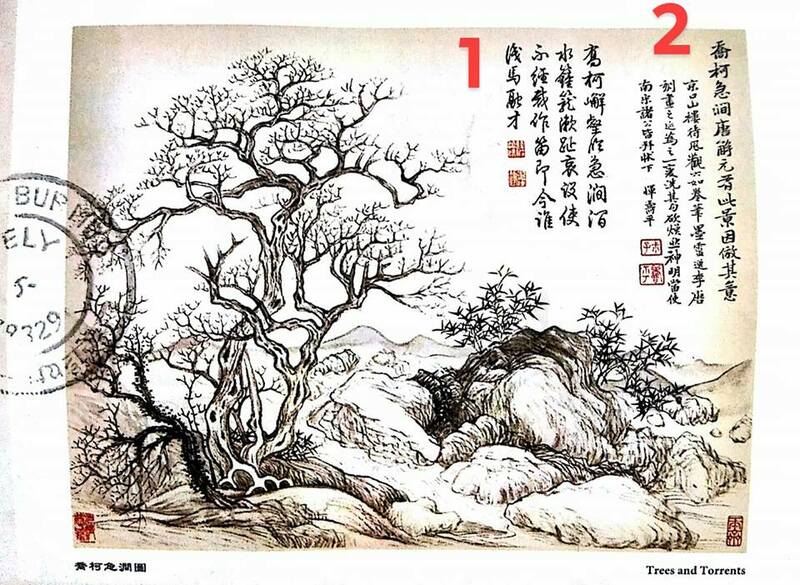 From it we can get that 恽寿平 praised highly about the painting style of 唐寅. The 1st part is the poem written by 乾隆, the emperor of the Qing dynasty. The paint was collected by him. Well, let me try to explain the poem in Chinese and hope someone translate it into English :) There's no modern Chinese translation available on the internet because Emperor Qianlong wrote so many poems during his lifetime and most of the poems are mediocre from an aesthetic perspective and this is one of them. Not the answer you're looking for? Browse other questions tagged translation classical-chinese or ask your own question. How to say “hope you'll have a great day”? Does this sentence sound awkward? How can I say “there was already a lot of salt in the meat”?